A region of fine wines, great gourmet delights, rolling hills, scenic sounds, waterways and lavender. Journey west from Blenheim along the state highway 63 to 'the village' of Wairau valley to 'Leighvander Cottage', nestled in this snug picturesque township of around 150 people. It all started when Elsie started to create an area at the back door to provide 'something beautiful the look at'. That somewhat understated comment has brought about a collection of patented species of Lavenders for the world markets, and a range of unique products. The magnificent Richmond Mountain Range which frames the property, provides many changes hues and moods which inspire some of the the ideas for Elsie's art. The delightful resorted Cob-Cottage of 1859 that the Hall Family live in centers the cottage gardens of yesterday that lead to the Garden Studio, which boasts a treasure trove of unique rejuvenating therapeutic products all made under the Leighvander Label. 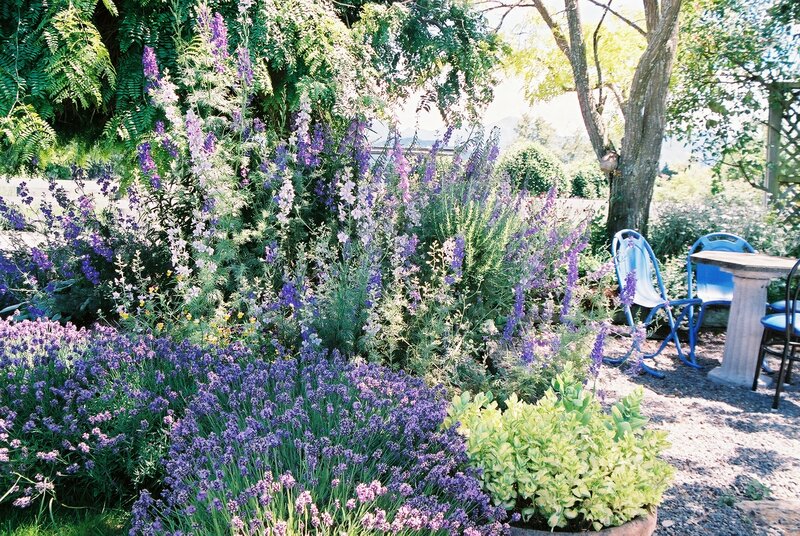 Lavender of all colors and hues frame the driveway.